Choco Crafters are Mumbai,India based Handmade chocolates Manufacturers, We manufacture a wide range of molded Chocolates with variety of fillings in different sizes & shapes. We are well established & Experienced in the market having substantial manufacturing capacity,capabilities & adequate facilities to undertake large Chocolates orders & are dealing with large organizations and corporates for their large Corporate Gifts,Business Promotion Chocolate Gifts,Events Gifts etc. 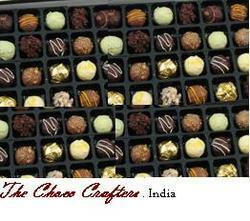 For over a decade 'Choco Crafters' has built itself to be a renowned company specialized in handmade Chocolates,Creating its Brand & market. Through contract manufacturing & private label manufacturing, the company has created radical change in the Indian chocolate Market by creating a market for Contract Manufacturing & outsourcing it's manufacturing capabilities and capacity to partners for chocolate private label manufacturing. We also work with Retail Stores & large Chocolate & Confectionery manufactures & cater to their requirement in manufacturing of chocolates with their Brand name or label, We solicit enquiries and orders for molded Chocolates on contract manufacturing or on job work basis For any enquiries for contract manufacturing of molded chocolates either on Private Label supplies or job work basis or just bulk supplies.